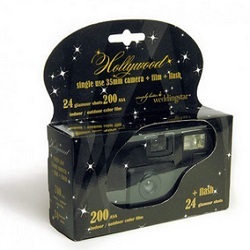 Hollywood theme wedding favors can be so much fun. The roles have been cast for your spectacular production, the lights are ready to roll, and you have the beautiful costumes pressed and ready for action. You are preparing for the biggest day of your life, and all the critics are raving about your married life debut. When it’s all over, you will watch it all on the big screen and smile through your happy tears. What better theme for your wedding than Hollywood? Whether you go old school glam with a sophisticated polish or liven it up with something fresh and modern, you can’t go wrong when bringing the red carpet, interviewers, cameras and paparazzi to your big day. This wedding theme is perfect for outdoor or indoor weddings, and you can use it for your ceremony as well as you reception. Throw a red carpet down the aisle and play the part of Cinderella prancing down the aisle to accept her glass shoe and ride off into the night with her prince. 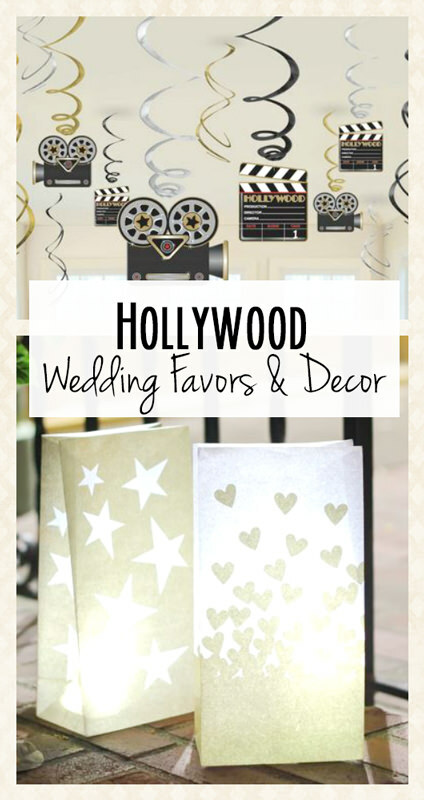 Alternatively, use some of the following Hollywood-theme wedding favors and decorations to entertain your guests after everyone enjoys a more traditional ceremony. 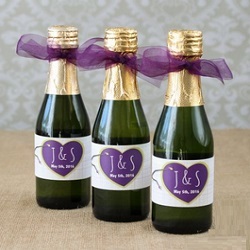 Sparkling Cider Mini Bottles - Set these bottles of sparkling cider on every table for your guests to enjoy, or hand them out to the younger crowd unable to enjoy your Hollywood-style bar. 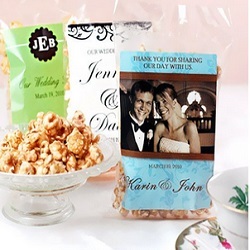 Not only are they adorable and personalized, but they are delicious gifts that your guests won’t let go to waste. 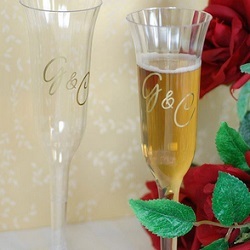 Personalized Plastic Champagne Flutes - They’re adorable and classy, and your guests will feel like stars sipping their bubbly in style. Your monogram is the perfect finish. Red Floor Runner - No Hollywood-themed wedding is complete without a red carpet. Use it as the perfect runner to walk on down the aisle towards saying “I do”. Another idea for this 15-foot runner is to use it as a meet-and-greet session with the paparazzi when your guests first arrive. 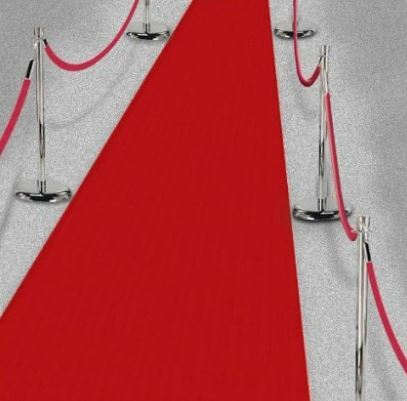 Who will be seen together on your red carpet? Just add the Paparazzi Props or a few real cameramen to give your guests the celebrity treatment. Personalized Hollywood Table Number Cards - Allow your guests to find their seats easily with these glamorous table number cards. You can add a customized touch to ensure they fit into your overall decorative theme. 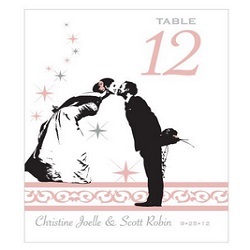 Personalized Hollywood Printable Program Paper - This vintage Hollywood-themed paper matches the table number cards mentioned above. Create innovative programs to hand out to each guest as they enter the ceremony, and give them something to look forward to for the big party to come. 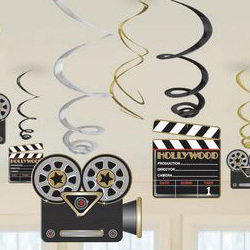 Lights, Camera, Action Hanging Décor - Bring the party to life with these Hollywood-themed wedding decorations that hang from the ceiling. Production-themed pictures are joined by gold and silver curled streamers to add some glitz to your big day. 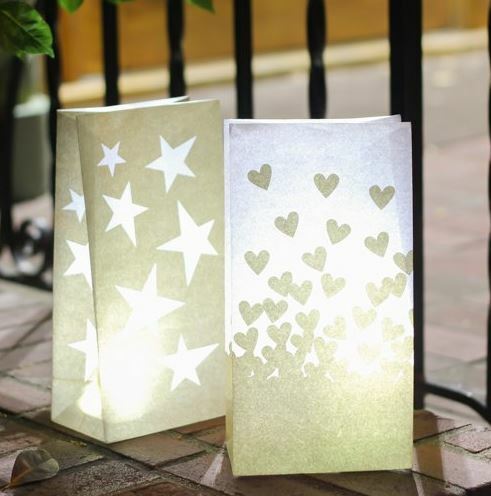 Star Luminary Bags - You need sand or decorative rocks as well as battery-operated tea lights to bring the glow from these star-studded decorative bags. This is an affordable, simple way to add elegance to your reception hall.